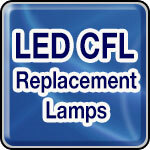 LED CFL Replacement lamps directly replace 32W, 26W, and 42W 4-pin CFLs. With easy installation and no need to bypass the CFL ballast, these lamps deliver 900 lumens of usable light. LED CFL Replacement Lamps are available in a choice of color temperatures with either a horizontally or vertically oriented design.